Here is the most recent project. It is the Sunflower pattern from Blomqvist and Persson's "Tatting Patterns and Designs". I'm very happy with the results. But, as a result of the project I have new questions. In both the first and second rounds there are many joins from the end of a chain to a picot on the previous ring. I reversed the work performed the join and then flipped back to the original side. Is this correct or how would you perform the join? Secondly, in the first round there is a join from the end of a chain to the base of a ring...this was a bit awkward for me and I am wishing they were a bit cleaner. Should I have left the dreaded gap at the base of that ring in order to join in the gap? What do ya'll think? 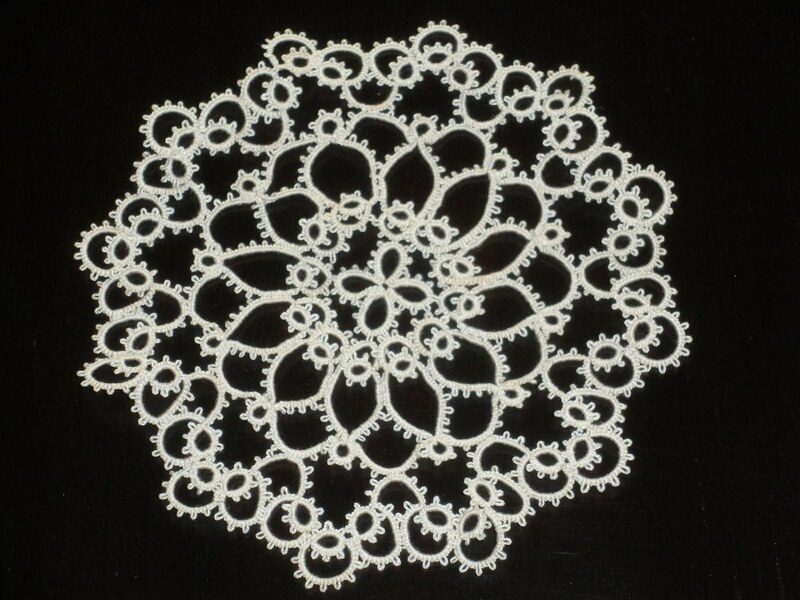 I like the doily without blocking...but, I think I'm going to block this one. BTW, the visit with my parents was priceless. We had a wonderful time. In just a few months of tatting, my 70 year old mother is taking to it like the proverbial duck to water. We bored our significant other as we commiserated in tatting and picking. Well, it's official...Mom's a true tatter! My parents have come for a visit and are staying a few days. It was kinda funny... within 15 minutes of their arrival, Mom and I were sharing our newest tatting acquisitions; threads, books, completed, and current projects. She even brought me a knot to pick....go figure! Here is her most recent book marker. She's sitting here concerned that it's not blocked and that the world will notice...help me out here. I'm quite proud of her work and told her not to worry. Our tatting world is nothing but kind and often quite humorous. I look at my thread. I fondle my thread. Forgive me, I put my head right in there and smell my thread. I close my eyes and the patterns form behind the eyeballs and - Bob's your uncle! There it is! I've been chuckling all week long. How do you decide what project to conquer next? 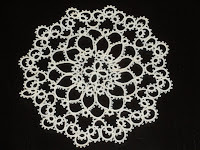 I'd be curious to know how you make your decisions to start on another tatting project. I've been sitting idle for about 2 weeks and need to get going on another project. I've gone through all my pattern books, perused the Internet, and worked to create a pattern in my mind... and I'm not really sure what the next project will be. I kinda want to start a large project...something like a large doily or, I've got an idea for a pair of baby booties. OR, I could return to the endless edging project, or more book markers...hmmmm. Help me out here. What do you think? I've been working frantically on a gift for a friend at work. She was recently diagnosed with stage 3 breast cancer. Her team of doctors are aggressively treating the cancer and will perform surgery in the near future. For some time now she has asked me to tat a project for her. I was not pressured and did not worry too much about it... until 3 weeks ago. When I heard of her diagnosis I immediately knew I needed to tat a hanky edge for her. Here is the final project. The source is Nikolajsen & Nilolajsen Tatted Handkerchiefs Lace No. 6. It is a two pass edge. The first pass utilizes 2 shuttles. The was the first project I used size 80 thread and found it much more cooperative than my first attempt. Could it be that I'm finally more aware of tension?...hmmmm. I had to modify the pattern a bit. I added a few doubles and deleted a picot. The modification didn't begin until I had finished 1/2 of one side...so, don't look too close. Her eyes welled up with tears when I gave it to her. She hugged me and stated, "now I have something to carry into surgery." It was a very strong response I was not expecting. I am so glad to have been able to help her moment that day. Please keep Robyn in your thoughts and prayers.